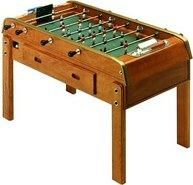 The B90 2 drawer foosball table model is made by the European-owned foosball manufacturing company, Bonzini. 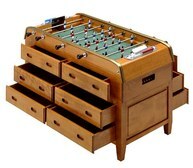 This table is an in home model made to look like a piece of furniture. 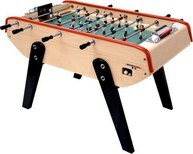 Because it is made to look like furniture, it does lack some of the features that are on the standard B90 foosball table model. 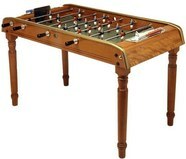 The table is heavier due to the natural wood and extra drawers, the handles are smaller, and the rods do not extend out far on the other side of the table. 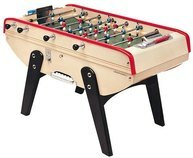 This is a more kid friendly table due to some of these features and also offers additional storage for extra foosball balls, silicone, or rags to clean your table. Even with the many differences of the 2 drawer model, this table is still a Bonzini and offers great ball control for catching, passing and pin shots.